​Kansas City Chiefs WR Tyreek Hill had himself a GAME on Sunday Night Football against the Denver Broncos. He scored three touchdowns: one kickoff return, one rushing and one receiving (which tied the game with 12 seconds remaining), and made history in the process. 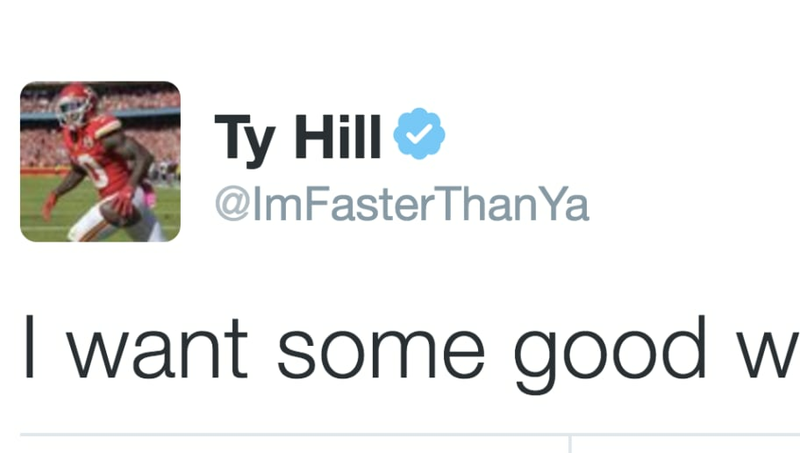 And what does Ty want after a performance like that? Candid, to say the least. Also understandable, but probably not for Twitter? ​​Well, Mr. Hill, if you're going to be in the spotlight after a game like this, you better make sure these types of tweets don't exist anymore. I mean, you could've deleted at least a FEW of them. Because it gets A LOT worse. Maybe you both should get off Twitter at 1:19 a.m.? Again, another conversation with himself. ....and boom goes the dynamite. During last night's epic 30-27 win for the Chiefs, Hill was obviously feeling it in the second quarter, so wouldn't it have been smart for him to ask his publicist or maybe the Chiefs social media manager to go through and vanquish this stuff in case he had an historic game? Well, at least he knows for next time.